Let’s Make Time for the Big Ideas! This week, as part of the Creative Computing Online Workshop, I decided to complete some of the recommended reading. In particular, Seymour Papert‘s 2000 paper, What’s the big idea? Toward a pedagogy of idea power, formed part of a very special week for me in discovering the “heart” of my beliefs about creativity and technology. (We need) a new direction for innovation in education: re-empowering the disempowered ideas. Educators faced with day-to-day operation of schools are forced by circumstances to rely on problem solving for local fixes. They do not have time for “big ideas”. The most neglected big idea is the very idea of bigness of ideas. Many (students) react badly to school because its emphasis on memorising facts and acquiring skills that cannot be put to use is like a prison for a mind that wants to fly. A kid who cares about ideas finds precious few of them in elementary school where he is expected to learn fact and skills that he experiences as excruciatingly boring. Papert also gives a specific example showing how educators opt for the “dumbed down” version rather than offering their students the opportunity to embrace “the big ideas”. He illustrates how the concept of probability can be taught at various year levels, using programming as the tool for teaching and learning. This reminded me of Dan Meyer‘s well-known TED Talk, Math Needs a Makeover, where he talks about students becoming “impatient problem solvers”. Many students are the product of their education – they have been “dumbed down”, become “impatient problem solvers” and had very little opportunity to develop the “big ideas”. So, why is it that many of the issues raised in Seymour Papert’s 2000 paper are, sadly, still current? What are we doing about it? For me, my “light bulb moment” occurred during a presentation at the Australian Computers in Education Conference in 2010. Steve Collis, Director of Innovation, from Northern Beaches Christian School, said, “I don’t think of myself as part of a school. 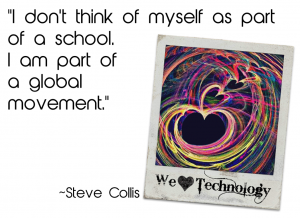 I’m part of a global movement.” I framed this quote and it is now displayed in our eLearning Room. It reminds me everyday that, whilst I am working hard to assist teachers to use technology at my school, I am part of something greater. What I do can not only have a positive influence on those at my school but also my colleagues around the globe. I share a common goal with educators around the world. It’s a goal that’s worth all the ups and downs, frustrations and even disappointments. Why? 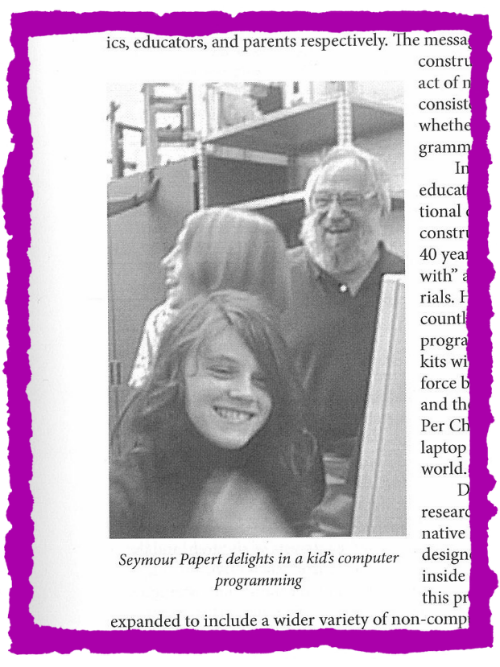 Because when you “delight” in a student’s achievements, just like Seymour Papert did, you know it’s worth it! 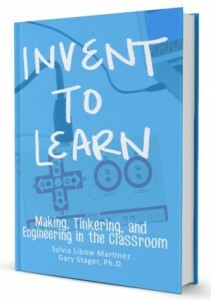 Click here for more information about Invent to Learn by Sylvia Martinez and Gary Stager. I was fortunate enough to attend the Exapanding Learning Horizons Conference which is held each year in Lorne. The highlights for me were many and varied. During a number of sessions throughout the conference, you could have been forgiven for thinking that we were attending a personal development conference and not an ICT one. For me, this was why this year’s ELH conference made an even bigger impact on me than previous years. I really felt that things were “coming together”, so to speak. Valuable lessons in life were merging with ICT and educational issues – I loved it! It was during two of the Critical Conversations sessions that I felt real connections were made between life and ICT in education. The discussions during both of these sessions headed down the ICT Professional Development path. In one session, I heard Margaret Meijers talk about the importance of the right attitude and, in another, I met Roy Williams, who told me of his great passion for Physics. 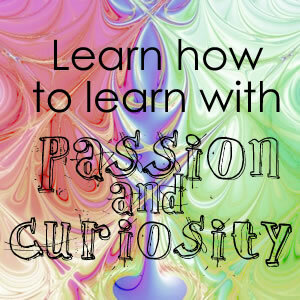 The idea of the importance of picking up on people’s passion and linking this with ICT was then raised during the Critical Conversation by Peter Steer. I was first introduced to the idea of Attitude determines Altitude by Roger Barrow, whilst he studied for his Private Pilot’s Licence. 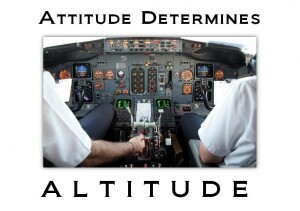 Although the “attitude” it refers to is the attitude of an aircraft, of course it also suggests that with the right mental attitude and self-belief, we can achieve great things! Teachers with the right attitude, even those who lack ICT skills, means that we are half-way there. Teachers who do not have the right attitude towards the use of ICT in education means that we have an even greater challenge on our hands! I would rather train a room full of “believers” who lack the skills than try to convince the “non-believers”! I was fortunate to spend an entire afternoon with Steve Collis as he outlined his school’s “Real Audience Project“. He illustrated the many innovative ways his school uses ICT to publish a variety of student work from traditional printed books via lulu.com to podcasts aired via their own school internet radio station using SHOUTcast. Steve’s colleague, Mark Liddell, gave an incredible presentation titled, “Technology Ideas for Mathematics“. Maths is definitely not my strength so I was intrigued to see how Mark approached his use of ICT with his students. Again, it was this presenter’s passion that shone through. If only I had a Maths teacher like Mark when I was at school! At the end of 2008, we embarked on our virtual worlds journey with the introduction of Quest Atlantis in our Year 6 English program. You can find more detailed information about this project on our My Quest Atlantis Blog. As Quest Atlantis is designed especially for middle school students, we started to explore ways in which we could extend this type of virtual world experience for our students. 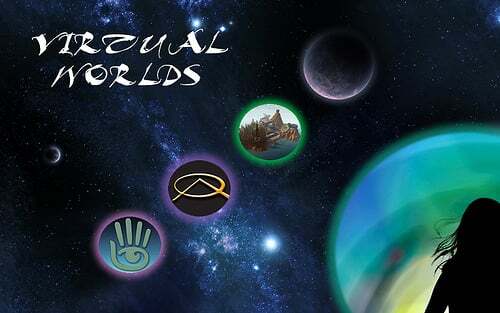 After exploring options such as OpenSim, Active Worlds and a closed estate in Teen Second Life, I was amazed and excited at the possibilities. I was aware of the wonderful work being done at Suffern Middle School in New York by Peggy Sheehy and, a little closer to home, at Northern Beaches Christian School by Steve Collis. I think the real “light bulb moment” came to me when I read Steve’s blog post, Practical Examples of 3D Virtual Environments for Learning in High School. As I watched the accompanying movie I was, to say the least, completely blown away! You may wish to read more about Booralie and Ramapo Islands on their blogs. I have been very impressed with the possibilities available to students and educators using a virtual world such as Second Life. In particular, the opportunities for students to develop 3D design or “building” skills are enormous. Their completed objects and buildings have a real purpose as they can then be featured in the virtual world and used by teachers and students as part of the curriculum. I have loved “playing” in jokaydia’s building sandbox so I can only imagine how much the students would enjoy this type of activity! At this stage, I have explored a number of different educational areas in Second Life’s main grid. I am particularly grateful to Dean Groom for suggesting that I explore the islands of jokaydia. It was the perfect place to start for a Second Life newbie like me! We are now at the stage where we will soon be putting together a project proposal and I have been in discussions with different staff members to gauge the interest in this type of curriculum development. Their reactions have been extremely positive and part of the purpose of this post is to provide a little more background information to interested staff. For those who have never experienced a virtual world, it can be difficult to visualise based on the blurry descriptions of an over-excited ICT Trainer! 😉 I hope the links in this post and the slideshow below will give staff a little more insight into the exciting possibilities of this type of project. If you are unable to view the slideshow below, you may wish to go directly to flickr and view the full set of images.